The number of hectares planted with potatoes declined from about 65 000 hectares in the early 1990’s to around 50 000 to 54 000 hectares from the mid-2000’s onwards. Production expanded significantly notwithstanding the decline in hectares as a result of, amongst others, the introduction of new cultivars, an increase in the number of hectares planted under irrigation, better soil practises and chemical control of pest and diseases. Important to note is that South Africa is self-sufficient in the production of potatoes, and this is done on less than 1% of the land utilised for agricultural purposes. In total, the industry employs between 45 000–50 000 people, which includes permanent and seasonal labour. Given this, the potato industry is a major contributor to employment opportunities in rural areas with significant socio-economic multiplier benefits to people in rural areas. Potato production in South Africa takes place in 16 production regions with the 4 major regions, namely Limpopo, Eastern Free State, Western Free State and the Sandveld contributing to between 65%–70% of the total annual production. The main agro-ecological influences are climatic conditions and availability of irrigation resources. The impact of climate conditions is illustrated by the bumper crop in 2015 as a result of good climate conditions, whereas the significant decline in the crop during 2016 was due to unfavourable climate conditions; more specifically the drought and high temperatures. 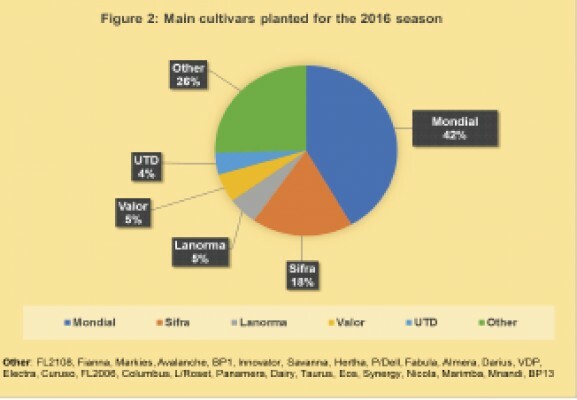 Figure 2 shows the main cultivars planted in 2016. 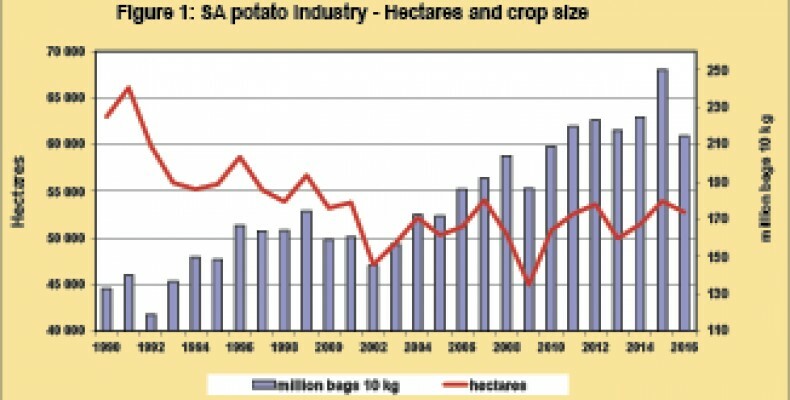 With South Africa consuming more than 90% of the total annual potato production, along with a long-term increase in production, total and per capita consumption of potatoes increased. 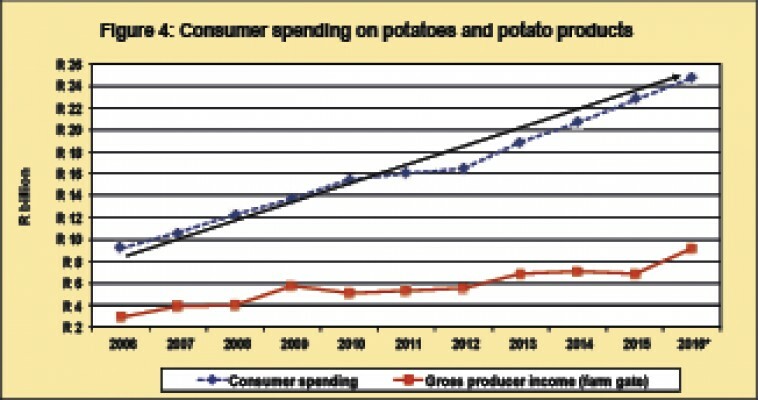 Several factors have an influence on consumers’ demand for potatoes, including, but not limited to, population growth, the price of substitutes, potato imports and exports, potato marketing campaigns, shift in consumer demand as the demographics of the major LSM (Living Standard Measure) groups in South Africa are changing, urbanization and changes in per capita income. Five major marketing segments consume the South African potato crop with the formal and informal markets consuming approximately 64%, processing 20%, seed potatoes 8%, and exports a further 8% (mainly to neighbouring countries). 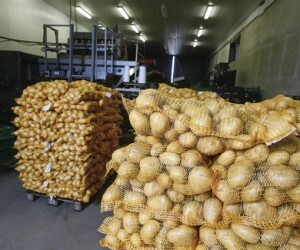 From the total potato crop, the percentage sent to fresh produce markets throughout the country has decreased over the past few years as more producers are marketing directly to the formal and informal markets. The percentage of the total crop sent to fresh produce markets has decreased by 9% over the past 10 years and for the 2016 season 46.7% of the total potato crop was sold through fresh produce markets. 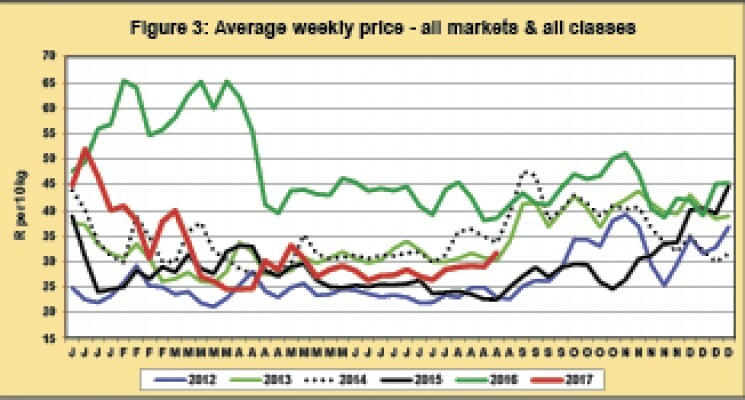 Figure 3 shows the average market prices for all classes of potatoes on all fresh produce markets since 2012. In August of 2017 prices were 36% lower than at the same time in 2016. This was due to the favourable production season with volumes on markets at 16% higher than at the same time in 2016. When comparing market conditions during August of 2017 to 2015’s market prices, prices were realistic considering the volumes handled by the markets. In 2015, a record production year, prices were 26% lower than market prices up until August 2017. The total value of the domestic potato industry can be derived from the total amount of consumer spending on an annual basis. The total value of consumer spending for 2016 was close to R25 billion (Figure 4). There has been an annual increase in total consumer spending on potatoes and potato by-products from 2006 to 2016, with an average annual increase of 8.9%. 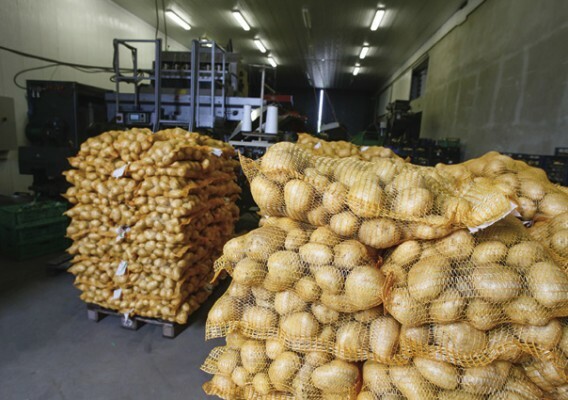 Thus, the industry is outperforming inflation, adding to the fact that the demand for potato products is increasing annually as seen in Figure 4.